Catch 35’s Lobster Bash 2018: Annual celebration of Lobster! It’s all about the “Maine” ingredient at Catch 35’s Lobster Bash: Annual celebration of lobster! Fresh North Atlantic Lobster specials are available all September long. As summer begins to wind down, lobsters are abound. At Catch 35, we celebrate the lobster with a variety of delicious starters, entrees, sides, and whole lobster for the month of September-available at both Chicago and Naperville locations. Lobster, once known as the poor working man’s dinner back in the 1800’s, is celebrated today as a luxurious treat for the well to do. Lobster is quite the versatile ingredient-sweet, juicy, and buttery-it can stand-alone or compliment a variety of fresh seasonal ingredients. Poaching, grilling, steaming, and sautéing are the preferred cooking method for lobster. When added to pastas, lobster adds succulent and sweet intensity. Use the shells of the lobster to brew a layered and rich broth reminiscent of the ocean. Adding chunks of juicy lobster meat and a bit of cream & fresh herbs; make the perfect bisque as the weather changes to autumn. I suggest tearing into some sourdough bread and soaking up the savory broth. Celebration of the lobster fishermen! 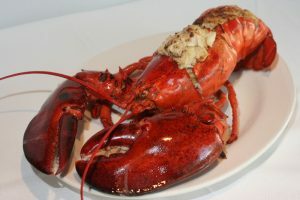 The majority of lobster is caught from late June through December. September is when the freshest lobster is available. Fishermen work hard for the days catch. Lobsters are trapped caught in the rough waters of the North Atlantic off the coast of Maine and Canada. Lobster fishermen do not have an easy job-a lot of backbreaking work goes into catching that juicy sweet lobster. The typical day of a lobster fisherman is setting traps usually around 800 and then in a window of three days picking up and hauling these traps for the weeks catch. The peak of lobster catching is usually at the end of August when the lobsters shed their shells; they trap easier. End of August into September is prime lobster season with the freshest lobster available. Therefore, we celebrate all the hard work with Catch 35’s Annual Lobster Bash in September. 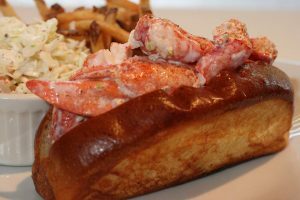 What’s new at Catch 35’s Lobster Bash 2018: Annual Celebration of Lobster? This year, Chef Eddie has added few new items to the classic favorites during Catch 35’s annual lobster bash. 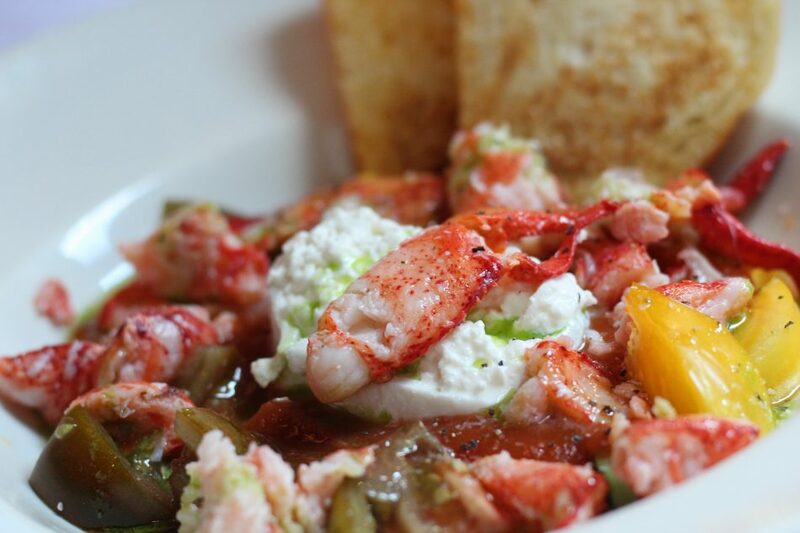 The Maine Lobster Chopped Salad highlights poached lobster with goat cheese, grilled asparagus, heirloom tomatoes, avocados, roasted red peppers, and chili lime dressing; a healthier option for lunch or to as a starter before the “Maine” dish. New preparation to the “Maine” Courses is the New England Lobster pot pie. Now, we have done a lobster pot pie in previous years but this year the pot pie is an ode to a Nova Scotia favorite creamed lobster. Off the coast of the North Atlantic Waters, lobster is a staple. Locals prefer lobster sautéed and added to a blend of cream and butter. In Nova Scotia, the lobster cream is laid on top of buttered toast. Inspired by the rustic flavors of Nova Scotia lobster cream, Chef Eddie has added seasonal root vegetables and shrimp to a flaky puff pastry for the ultimate lobster comfort food-New England Lobster Pot Pie. This may be your new favorite lobster bash special! 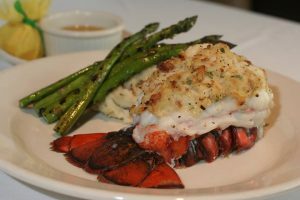 Classic Lobster Bash Specials-Customer Favorites! It’s what you have been anticipating all year long! Whole lobster, overstuffed with crab, steamed to perfection with roasted corn, and parmesan red potatoes. Filet Mignon Oscar style with béarnaise sauce and lobster-Crab stuffed lobster tails-Connecticut style & Signature & Sriracha Buffalo Lobster Rolls-Award winning lobster mac & cheese-Lobster poppers-Maine lobster bisque. You need to wait no longer these customer favorites are back! Get Crackin’ & reserve your table today! See you soon.